To help pros and DIYers get the most professional-looking results, the abrasives industry is constantly adapting to new trends and practices in sanding. Most recently, we’re seeing woodwork coming from the mill or factories with a better finish than ever before. This requires less coarse-grade sanding and more medium- to fine-grit work — a change reflected in the abrasives industry with a shift from coarse grits to finer grits. In addition, manufacturers are continually developing products with the goal of making sanding easier and jobs more efficient. Take, for example, 3M™ PRO GRADE PRECISION™ with NO-SLIP GRIP™ Backing. These sanding sheets feature a special coating on the back that reduces slippage during sanding and requires less hand and finger pressure to hold the sheet in place. That means less hand fatigue and longer sheet life — this product lasts up to 10 times longer than traditional 3M sanding sheets of comparable grit. Plus, whether you’re working with extreme stock and coating removal or creating beautiful, fine finishes, 3M offers products featuring ceramic minerals and mineral blends that provide excellent sanding performance — for faster, easy sanding. Another shift we’re seeing is the newest generation of abrasives users making the move to power tools for coarse-grade work, for quicker and easier stripping of old coatings from existing woodwork (doors, trim and furniture). Once this step is completed, hand sanding (usually medium- to fine-grade) can begin. During this stage, a versatile, multi-use product like 3M™ PRO GRADE PRECISION™ Ultra Flexible Sanding Sponges is ideal. These innovative sponges feature a flat side (just like a traditional sanding sponge) that’s great for sanding flat areas. 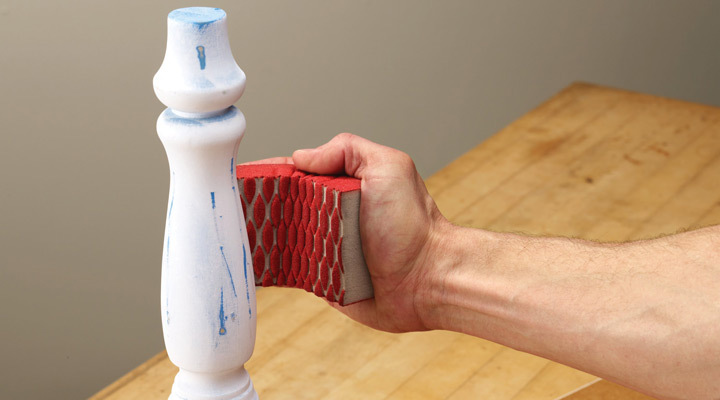 However, the other side has a grooved surface that makes it much more flexible than traditional sanding sponges — plus, it channels dust, making it clog resistant. These sponges are perfect for hard-to-reach detail areas and reduce hand fatigue compared to traditional sanding sheets. Remember, for a beautiful finish, always sand in stages from coarse to fine. With the right abrasive, you can achieve stunning results that you’ll be proud of. © 3M 2016. All rights reserved. 3M, NO-SLIP GRIP and PRO GRADE PRECISION are trademarks of 3M.